For those who might shy away from attending Barrington Stage’s “A Doll’s House, Part 2” because they had never seen Henrik Ibsen’s “A Doll’s House” rest assured that, while the latter might help explain characterizations, it is not necessary. This play stands on its own. 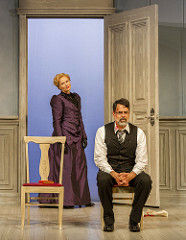 Ibsen’s play ends with its female protagonist closing a door. Lucas Hnath’s play begins with the same woman opening this door. While the stories were penned approximately 140 years apart, the current play’s date is set only 15 years apart. Yet, has much changed in the 140 or 15 years? The crux of the script is feminism. The 1960’s hit song, “You Don’t Own Me,” blares throughout the production. Again, whether the date is 1963 or 2018, both plays are applicable. While Ibsen shocked his audiences, Hnath reminds his audiences that women can be independent. The quartet of actors is excellent. Most scenes are performed in duets, with each character holding her/his ground equally. Laila Robins (Nora) never lets her audience forget that she has made her character a woman who was perfected determination with gusto. Robins gives Nora a cool confidence that is downright freezing until she begins to thaw, but ever so slightly. Christopher Innvar (Torvald), a constant at Barrington, establishes Nora’s husband not as domesticated and demanding when last we saw him, but unexpectedly a sadder yet wiser man. Ashley Bufkin (daughter, Emmy) speaks in staccato, addressing her mother unsympathetically, yet with twinges of not-so-hidden pain. Mary Stout (maid, Anne Marie) looks like Mrs. Potts, but she never lets her character become subservient. An equally distributed mixture of 19th and 21st century language (several contemporary expletives), costumes, set, and sound create balance between the old and new plays. Yet, I stick to my statement that while Hnath’s work springboards from Ibsen’s, it is not different as one part of history triggers into any other. Attending the post-production Talk Back, led by Artistic Director Julianne Boyd, offered some surprises, the most important to me being a question on why the play has been billed as a comedy. Ibsen’s statement in the late 1800’s was serious and even painful to hear. This evening’s audience balanced laughter with silence simultaneously. Boyd explained the playwright’s intention that the story is meant to be determined either way – no right or wrong. BSC’s audiences have been quiet one night and laugh the next. Each presentation is singular and received differently by playgoers.